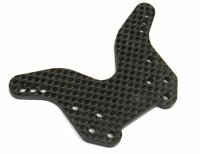 Front shock tower for the Yokomo B-Max 4 III. Made from 4mm carbon fibre, this shock tower has also been redesigned to be overall thicker than the original for increased strength along with the extra strength provided from the thicker carbon fibre. It also has an extra shock mounting hole further inward than the inner original mounting point. Made from high strength 4mm 100% carbon fibre. Gloss surface both sides.